Wishing you a "Not Evil" New Year! 2010 has arrived and our New Year’s resolution is to remain committed to bringing forward the truth about Global Warming hysteria. During the new year this message must take root and we can accomplish this by having Not Evil Just Wrong shown in every school in America. Last week, a Rhinebeck High School sophomore named Michelle Drewkett stood up to her school board about the biased teaching of climate change. It is a story we hope to see repeated many, many times in 2010. We are in an ideal position to make this coming year a success thanks to your support in 2009. Over 400,000 of you participated in our premiere on October 18th and have continued to support our message discrediting environmental alarmism. Our message is being heard. This was especially evident during the Copenhagen Summit, when environmental alarmists reacted violently to our hard questions about climate change. The backlash to our questions started when an armed UN security guard threatened Phelim for asking Professor Schneider about climategate and continued with the subsequent questioning of Al Gore, who not only ignored questions about climategate, but had our mic killed while literally running away from us. The opposition’s violence reached its climax days later, when environmentalists pelted Phelim with vegetables during a live television interview with Neil Cavuto on the Fox News Channel. There is a genuine appetite for real questions and real journalism, asking the tough questions about Global Warming hysteria. 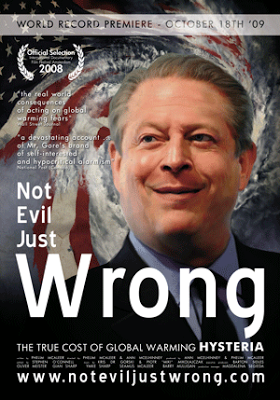 Which is why we’ve planned a few surprises to expose the hypocrisy of powerful environmentalists in 2010. We can’t go into details (because we want to catch them in the act), but believe us you’ll want to stick around to see the truth about extreme environmentalists and environmentalism. So far over 1 million people have watched our YouTube reports on the issue. This is an astonishing number and shows that people are rightfully skeptical of what they are being told about Global Warming and appreciate investigative journalism that asks difficult questions of those in power. These same hard questions need to continue to be asked in 2010, and what better place than in our schools? We will be publishing a new lesson plan in the new year to help students learn that climate change as definitive science is anything but settled, but we need your help to ensure it is shown in classrooms. Please persuade and even pressure school boards and teachers to restore some balance in the classroom. Contact us day or night if you want Not Evil Just Wrong shown in your local school in 2010 and let’s make sure the new year is a year when difficult questions continue to be asked. Happy New Year to both of you too! Keep up the fight! Next Next post: Global Warming? What Global Warming?